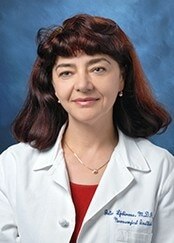 Julia Ljubimova, MD, PhD, director of the Nanomedicine Research Center in the Cedars-Sinai Department of Neurosurgery, has received a $2.8 million federal grant to advance her research of tumor nanoimmunology to treat cancers of the brain, breast, lung and other organs. The five-year grant was awarded by the National Cancer Institute of the National Institutes of Health. The funds come on top of four previous grants to support Ljubimova's work. In all, the institute has awarded Ljubimova $16.5 million over the last five years. "Our goal is to improve the body's immune system so it can block tumors from forming," Ljubimova said. "This new grant will allow us to continue developing a new generation of drugs that will have the ability to improve the pharmaceutical and pharmacological properties of anti-cancer drugs, increase the efficacy of cancer treatment and deliver multiple types of therapeutics for combination therapy." The Ljubimova Laboratory strives to improve the treatment of brain, breast and lung cancers, focusing in particular on forms of the disease that have a poor prognosis or are largely incurable with current therapies. Ljubimova said the goal of engineering and producing nanomedicines is to reduce the toxic effect of anti-cancer drugs by delivering them directly to cancer cells, leaving non-tumor cells intact. Nanodrugs have been shown to effectively treat tumors that originate in the brain, as well as breast and brain cancers that metastasize from the lungs and breasts. The nano imaging MRI diagnostic agents engineered at the Nanomedicine Research Center have the potential to replace invasive tissue biopsies, particularly in patients who have multiple brain lesions. Ultimately, Ljubimova and her team want to bring these novel imaging and treatment drugs to clinical practice with patients. "For the patients, we hope our work will bring more efficient treatments and that the side effects of the treatments will be significantly reduced," Ljubimova said. The new grant is NIH/NCI R01CA206220-01, "Nanoconjugate delivery of proliferation and checkpoint inhibitors to treat glial tumors," 05/01/2016-04/30/2021.